About 1,800 members of the Quinnipiac University community will take part in The Big Event, a day of community service, on Saturday, April 9. 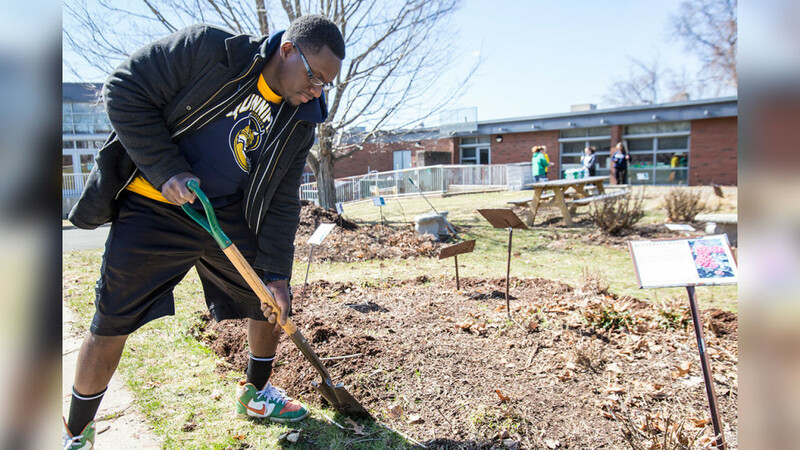 Quinnipiac University student John Midy edged flower beds at Bear Path School in Hamden during the 2015 Big Event. The Big Event is co-sponsored by Quinnipiac’s Student Government Association and Community Action Project. Quinnipiac students, staff and faculty will form 234 teams and spruce up more than 100 sites in Hamden, New Haven, North Haven, Orange and Seymour. Gianna Costantino, a senior and co-chair of The Big Event, said 1,800 is a record number of participants for the community service day. Participants will volunteer at specific locations, including: along the Farmington Canal Trail, at the Hamden Youth Center and Miller Senior Center in Hamden; at Edgewood Park and Edgerton Park in New Haven and at the Connecticut Partnership for Children in Seymour. About 200 students are expected to clean up at Camp Cedarcrest in Orange. Quinnipiac alumni also will participate at volunteer sites across the country. The Big Event is a nationwide day of community service when colleges and universities send teams to volunteer and perform three hours of community service in the community. Students also collect money and non-perishable food items to benefit area charities. The Big Event kicks off at 9 a.m. with opening ceremonies at the Recreation Center on the Mount Carmel Campus. The students will visit the various sites from 10 a.m. to 1 p.m.
“It’s very exciting, but it’s kind of nerve-wracking,” said senior Thomas Frotton, co-chair of the Big Event. This is the seventh year Quinnipiac will hold The Big Event, which began at Texas A&M University 32 years ago.